Fareed Zakaria, CNN host and editor of Newsweek International, opened the Pittsburgh Middle East Institute’s second annual conference last Wednesday at the Carnegie Music Hall. A leading analyst of international relations, geopolitics, and the global economy, Zakaria discussed the growing significance of the Middle East on the international political stage. According to Zakaria, the real solution to the Middle East crisis lies within the changing socioeconomic fabric of the region itself. “The desire to combine modernity with authenticity is the real solution to the extremity and regress in the Middle East,” Zakaria said. Former Treasury Secretary Paul O’Neill introduced Zakaria as a “master at getting knowledgeable people to discuss important issues,” referring to his talk show, Fareed Zakaria GPS, a weekly CNN production on public affairs. Zakaria dismissed the idea that capitalism faces a bleak future as a force in the world economy. “A year ago, people predicted the downfall of capitalism and a complete transformation of the world stage — as of today, well, looks pretty much the same to me,” he said. Zakaria explained that the ordinary citizen’s fears of the economic crisis are analogous to those provoked by the swine flu epidemic. “The nature of the problem is indeed dangerous, but the government is effectively responding,” Zakaria said. Similarly, he suggested that despite the Wall Street collapse, the government, the businesses, and the people responded to the crisis, which in turn is helping the economy swing back into shape. 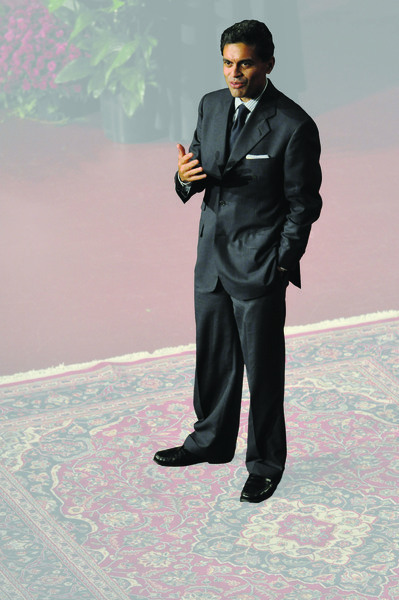 Tapping into Middle Eastern affairs — his specialty — Zakaria proposed a robust capitalist solution to the woes of the region. He also discussed the decreasing impact of Islamic fundamentalism on the Muslim population, and how a shift toward a more capitalist culture in the broader Middle East can further help uproot the desire to follow an extremist agenda. The Middle East spans southwestern Asia, southeastern Europe, and northeastern Africa, with many oil-rich monarchies — such as the United Arab Emirates and Qatar — located in and around the Persian Gulf. The wealthy monarchies, Zakaria suggests, represent the future of the Middle East as they continue to modernize in a slow organic manner instead of booming into brutal dictatorships. The United States fears Islamic fundamentalism without noticing that its lure in the Middle East is gradually diminishing, Zakaria said. The Middle East is awakening to the dangers of “jihad” as Muslims begin to see the futility of violence as a political tool. “Violence is a lost political argument — Osama bin Laden can instigate terrorism but not get 5000 people out on the streets to demand his ideal Islamic society,” he said. Along with a greater sense of awareness, the embrace of modernization is at the heart of societal progress in the Middle East, Zakaria said. He cited Dubai, United Arab Emirates, the booming metropolitan center of the Arabian Gulf, as symbolic of the new Middle East. Along with Dubai’s strong command of commerce, its robust government, global managerial standards, and lack of corruption demonstrate the ability of countries in the Arab world to climb the socioeconomic ladder even as they hold tightly onto their religious and cultural backgrounds. “Dubai is an example of how the Arab world can have diversity and manage it well,” said Zakaria. During an interactive Q&A session, Zakaria also discussed the increasingly competitive relationship between the United States and China, U.S.-Iranian relations, and the Israeli-Palestinian conflict. On the Israeli-Palestinian clash, Zakaria said that peaceful coexistence can only be achieved when both sides realize that they have much more to gain through cooperating with each other on a political and economic level. “Israel needs to realize that moving forward with Gaza limits its potential, and the Palestinians need to understand the enormous value to them of coexisting with the Israelis,” he said. “It was interesting to witness a major political analyst debate such ‘hot topics,’ ” said Eduardo Benatuil, a senior economics major. “Lectures like Zakaria’s are very important because they offer not only Carnegie Mellon, but the entire Pittsburgh community, a different outlook on affairs that shape the political future of the United States and the world at large,” he said. In 1999, Zakaria was named “one of the 21 most important people of the 21st Century” by Esquire magazine, and in 2007, his name was included among the 100 leading public intellectuals in the world by Foreign Policy. With a keen eye toward Middle Eastern affairs, Zakaria has also penned several books, including The Future of Freedom and his recent best seller, The Post American World.